Flamenco (Spaingie pronunciation: [flaˈmeŋko]) is an airtform an genre o muisic an dance native tae the soothren Spainyie regions o Andalusie, Extremadura an Murcia. It includes cante (sangin), toque (guitar playin), baile (dance) an jaleo, which refers tae the vocalisations an rhythmic soonds o palmas (haundclappin) an pitos (finger snappin). ↑ Landborn, Adair (2015). 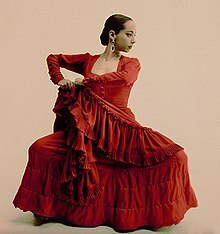 Flamenco and Bullfighting: Movement, Passion and Risk in Two Spanish Traditions. Jefferson, NC, USA: McFarland Books. pp. 107–108. This page wis last eeditit on 13 Februar 2016, at 23:58.